ICE Orb Floating Bluetooth Speaker | Nerd Much? There are quite a few cool Bluetooth speakers on the market, and in fact, there are actually a handful of floating speakers available, too. 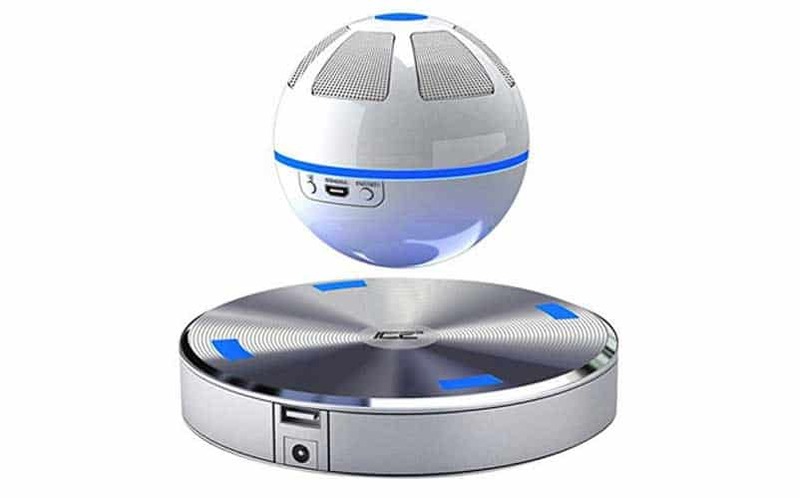 But, the coolest floating speaker we’ve seen is the ICE Orb Floating Bluetooth Speaker. It’s a gravity-defying Orb that levitates above its base, and it looks like something straight out of Star Wars. The ICE Orb allows for 10 hours of playback on one charge and floats 10mm above its base. It has a white and blue design with a full 360 degrees of speakers along the top so that everyone in the room is able to hear you blasting Hanson (we won’t judge you). And, it also has a USB port to charge your tablet or smartphone right from your desk instead of having them hanging from a nearby wall socket. Not only does it float, but it also spins as it plays your music. The ICE Orb isn’t all about the looks either, as the sound that it puts out is clear and crisp. You’re able to play music loudly without distortion, and the company responsible for this bit of genius has ensured that the orb spinning neither compromises on sound quality nor on clarity. Of course, this isn’t the first time we’ve seen this type of floating speaker, as last year, Kickstarter helped launch the OM/One, which also looked cool but failed in execution. Hopefully, the ICE Orb doesn’t follow suit. Check out more cool gadgets and other cool stuff from Nerd Much. Buy the ICE Orb here.